Just to the east of Nome, old mining activity had left some ponds, replete with rusty machinery, and only by the kindergartener's persistence were they reachable. Swans liked these ponds. Nobody bothered them there, they could nest and hatch their eggs in safety. 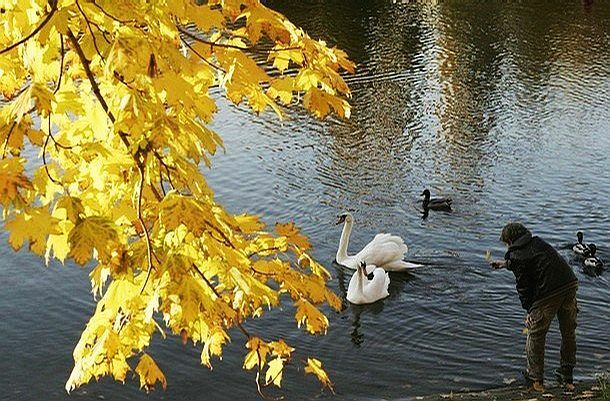 At first the swans were alarmed by the boy, but the little fellow did not throw rocks. Instead, he often came with corn, nuts and other goodies. 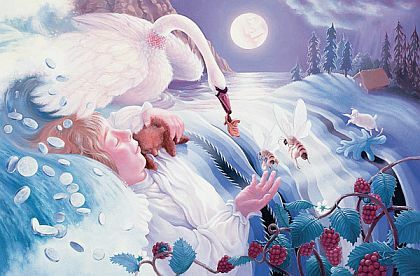 The swans trusted the boy, and would gather around him. Basking in the warm sunlight, the boy could imagine the swans' voices: “Hi, I am Papa Swan.” And they told the boy about the beautiful places they'd been, and the wonderful things they'd seen. The fall days passed, one after the other, with the inevitable progression of the seasons. Mrs. Robinson, the boy's mother, was a fastidious society woman. She didn't work too hard at her job, and often invited society ladies to her home for tea and cakes. She was very proud of her polished hardwood floor, her chandeliers, her lamp shades, her paintings, and her carpets. For a day or two the boy would mind, but the ponds and the swans were irresistible. Mrs. Robinson could not count on a clean, neatly dressed boy to show off to the visiting ladies. And, because she was the mother, and could not hate the boy, her hatred was focused on the swans. “They have no right ...” she would mutter. And her resolve steeled. One day, after the boy had gone to school, she went to the closet and loaded the shotgun; and she trundled and stumbled to the ponds. There she saw the swans, and she fired both barrels. And in the warm, caressing breeze, the dead swans slowly drifted away. “There! Problem solved,” she said to herself. And went about her life and work. But that afternoon the clueless boy went directly from school to the ponds. He could not find the swans, and he called for them. “Papa Swan, Mama Swan! Where are you?” But the swans were not to be found. His only answer was the whisper of the breeze among the reeds, under the hot arctic sun. Increasingly the boy got more agitated. He called repeatedly and he walked around the ponds, getting muddier and wetter by the minute. And he tripped, fell into the pond, and his head struck a steel remnant of machinery. The boy was stunned, and he sank. He opened his eyes, but was dazed. He knew he should not breathe water, but in his confusion he did not know which way to go, and his lungs burnt with the effort of holding his breath. And as he squirmed and looked, he saw the shimmering surface of the pond, and upon it was the outline of a bird. A bird whose wing reached into the water and touched him. The boy grasped the wing and the bird led him to the shore and safety. And in his mind he again heard the bird's voice, “Me too, I was away for a bit but I saw you fall and came over.” Mama Swan and the young birds also approached and told him “you are all wet! You can't stay dry in the water like we can!” Relieved, the boy conversed with the birds and whiled the afternoon away as usual. But then, Papa Swan said, “We have to go. It is time for us to migrate south. The other birds are calling to us.” And the boy looked skyward, and saw the vee formations and heard the honking and squawking of birds upon their migrations. One of the youngsters said “Why don't you come with us?” “Yeah, why not?” asked another one of the young birds. “Sure you can,” said Mama Swan. And upon opening eyes, his arms were long and feathered, and he could feel the breeze on each of his feathers. “Practice with us,” said the young birds. And the boy took a few short hops. But the call of the formations overhead was strong, and Papa Swan again repeated the invitation. “Come with us. Stretch your wings and fly up.” And the boy did so and soared into the sky, and fell in line with the birds. He looked down and he could see ponds, beaches, capes, lakes, mountains and other wonders. “But my mom will miss me,” he said. And the boy did not worry any more, and flew away from his home; the sun glowing golden in the puffy clouds ahead of him. And he was happy and contented to be with his friends and their kind. But back home, when Mrs. Robinson went looking for him, all that she found was her lifeless boy floating face down in the water. Copyright © 2009 Ramon Gandia.